St. Lucia is one of the Caribbean’s most spectacular islands when it comes to its scenery. From mountains and attractions that trace their origin to this place’s volcanic past, to its collection of paradise beaches, there are plenty of subjects to focus on here. Once you have booked your place using the following St Lucia holidays – Caribbean, plan your photographic itinerary slotting in the following points of interest on St. Lucia. The remnants of two volcanic plugs that remained after the volcano that formed them eroded away, the twin peaks of Gros and Petit Piton are an iconic image of St. Lucia. Featured prominently in tourism literature and depicted on the label of its national beer, it is a scene that every photographer visiting the island will want to capture before heading home. A popular place to get a shot of these twin spires is from Hummingbird Beach, which will give you a beautiful foreground to contrast with the majesty of the Pitons in the background. Additionally, the main road between Castries and Soufriere has excellent sight lines – just be sure to pull well off the road before setting up your gear. The islands of the Caribbean are famous for having some of the most photogenic beaches in the world, and St. Lucia is no exception to this rule. While the previously mentioned Hummingbird Beach is a great place to kill two birds with one stone, those seeking straight up shots of a tropical paradise without having the Pitons in the background will find great subjects on Halcyon Beach. 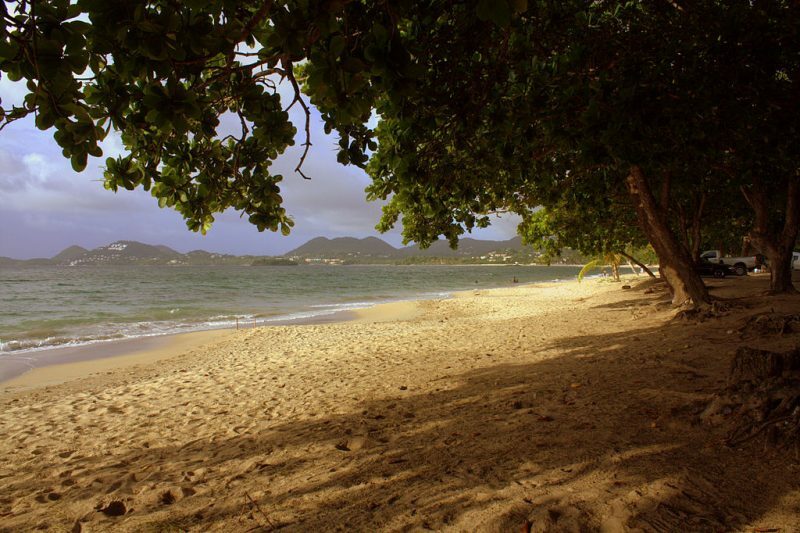 This place might be occupied by a resort, but know that all beaches in St. Lucia are open to the public by law. With white sand, droopy palms, and water that shimmers with multiple shades of blue and green, you’ll have plenty of things to shoot during your visit here. St. Lucia was formed through volcanic activity, and these forces continue to influence the island in the present day. The best example of this can be seen at Sulphur Springs, where the magma deep within the earth heats up sulphur-rich mud springs to temperatures that exceed 170 degrees Celsius (340 degrees Fahrenheit). The steam rising from the pools, the broken earth surrounding it, and the lush vegetation on its periphery can be challenging for amateurs to capture, but for skilled photogs, this attraction is a compelling subject. The baths nearby offer muck heated to a soothing 45 degrees Celsius (110 Fahrenheit), so don’t forget to pack your trunks! Home to British forts that were used to keep an eye on the French stationed in nearby Martinique, Pigeon Island is a great place for those looking to do a history set on St. Lucia. The crumbling remains of the officer’s mess and rusted cannons sitting atop grassed-over ramparts await photographers here. Additionally, Pigeon Island is the perfect vantage point to aim your camera back at the mainland, allowing those with zoom lenses to capture views of the beaches that line the shores of Rodney Bay.